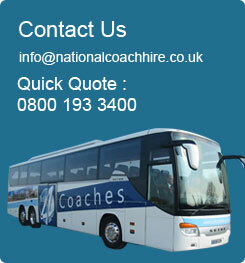 National Coach Hire are very experienced in providing corporate hospitality vehicles for either a day at the races or transporting VIP passengers for your next business trip, W/C, DVD, Sky TV, Kitchens, Lounges, Tables, Lap top Points and wireless connectivity are just some of the features you can expect to receive with a corporate hospitality vehicle, if it is privacy you are requiring then their are also vehicles with privacy glass for your comfort. We can also organize catering to order along with a hostess service, if your trip is for a sightseeing tour then talk to us about a Blue Badge Tour Guide, these are industry recognized bilingual tour guides to ease you through the day. Call us today to discuss your requirements on 0800 193 3400 or alternatively fill in the online quotation form and we will will get back to you.